One of the main reasons I started this blog was because my disease has made me driven and unrelenting when it comes to finding answers and help. I always thought I was an assertive person, but having something seriously wrong with me and navigating our healthcare system has become a job for me, taught me so much and has impassioned me to help others. I want to share the beginning of my journey and why pushing for answers has helped me to be where I am today. It was September 2011 when I first started having pain in my knees. I’d gone for a run that day and thought it was weird that I had pain, after the pain continued for a week I thought I should go to the doctor. When I saw my GP she told me I had patellofemoral syndrome, also called ‘runner’s knee’, meaning my patellar was not tracking properly. She prescribed physical therapy and I went to a few sessions, but every time I went to PT the pain got worse and worse. I lived in San Francisco at the time and after a few weeks I couldn’t even walk to the physical therapy office anymore. I called my doctor, she was dismissive, she was convinced it was runner’s knee and gave me a cortisone injection. The injection did nothing, in fact it made it worse. I called my doctor two days later and couldn’t get her on the phone and cried to the assistant who picked up and said, “listen I know there is something really wrong with me and I need further diagnostics”. My doctor ordered me an MRI. When we got the report back she said it showed nothing, EXCEPT there was a line in the report that said I had a heterozygous marrow signal. I had no idea what that meant, she told me she didn’t know what it indicated and neither did any of the other doctors in her office. I searched heterozygous marrow signal on the web, hardly any postings on it came up, but I did read that it could be an indication of bone cancer, or lesions. My gut feeling was that my heterozygous marrow signal was an indication that something was going on in my body whether my doctor believed so or not. At that point I called my doctor and said I needed to meet with an orthopedic specialist. I will share more of story tomorrow, but what I realized very early on was that NO ONE was going to care about me as much as I did! I have a wonderful supportive husband and family, but I listened to my body and I knew it was trying to tell me something and I have became my most important advocate. 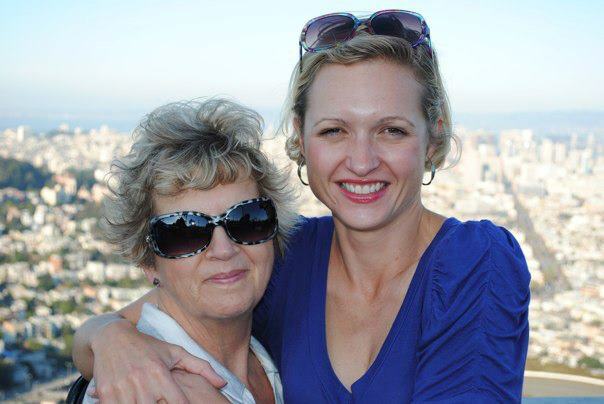 A picture of my Mom and I, who has looked after me with so much fierce love. This entry was posted in Being Your Own Advocate and tagged Being Your Own Advocate by osteonecrosis77. Bookmark the permalink. Good picture! I remember that one day I went out to get the mail in our condo; required a HALF step down and my ankle felt like it was broken. I thought this odd, but after about a week, when it was no better, I talked to my doc. She ordered an MRI. This didn’t resonate, either and I went blithely along, because my ankles weren’t always problematic. It’s only when all joints and long bones in my body, go in the action, that I realized what I’m up against. This has ruled my life for the better part of 12 years, changed my life, I’ve gained weight and my health has overall taken a downturn with the ON and a lung condition that is progressive. No cure. But, I learned nothing about either of these conditions in nursing school, and I aim to teach what I’m learning about ON to other nurses, so they won’t be giving you the doubting, the HAIRY eyeball-as if you’re rom another planet! I was JUST driving back from lunch thinking this VERY same thing. I was thinking more about the clotting disorder that you mentioned and how I may never known that to be a possibility if it wasn’t for your blog. You and I wouldn’t even be blogging about our experience if we didn’t think we had some things to learn and share from becoming our own advocates. And in some ways, we all become advocates for each other. I was also thinking about how I had to ask my rheumatologist about going to see a hematologist, because he didn’t “connect the dots.” In a way, we become our own doctors and we have to inform them about what is happening. I’m so glad you have your husband, and family and a wonderful mother for support! I know that makes a world of difference! Wow. Your story is phenominal. How well I understand it. I acquired Avascular Necrosis of both femoral heads due to steroidal (prednisone) treatment for migraines back in 1996, and in 1999 after walking, dancing and 1 month of being a newly wed, it changed my life. Originally, I was misdiagnosed as having pulled my groin on the right side. However, as I continued therapy I got worse and began to feel the same “popping” sound and pain I originally had only in the right on the left as well. After 2 failed decompression surgeries of both hips (femoral heads) in 99, I went from crutches to a wheelchair in a few months due to the pain and difficulty ambulating. I had to use a wheelchair for 10 years and the pain was unbearable. It is like hitting your “funny bone” but in the hip groin area with no relief. Additionally my lower back, gluts, and chens hurt tremendously as well. Due to depending on my arms and hands so much I lost feeling in my pinky finger and had to have carpal tunnel and ulnar nerve repositioning surgery. Finally, after too much pain and facing my fear of further hip surgery after the decompression surgeries went array, I had double hip replacements at 35 in 2009. Until this February I was able to walk short to medium distances using my motorized wheelchair for primarily long distances. However, before I could completely tackle the long distances I experienced what I thought to be a sprained ankles after jumping down too hard on them. I wrapped them and began exercising and they got worse. I had x-rays with no real issues except minor arthritis. I had a brace put on the worse of the two, the left and they continued to get worse. So in early July I had MRIs of my ankles to find that I have AVN of both talus (ankles). What a hard blow. After failed decompression surgeries on my hips I refused to have it again. My doctor says I’m too young for fusing so he perscribed a custom bracea for the left and keep wrapping the right. Since I am in the early stages, I plan to take holistic measures with Chinese herbals through the Institute of Traditional Medicine – http://www.itmonline.org/ ; I pray that this information is a blessing to someone else seeking non-surgical means or supplement after surgery. My faith in God as well as the love and care of my husband, family and friends have seen me through. I’ll be praying for all of you suffering this painful disease as well. Cassandra, I’ve had a history of runner’s knee, bursitis (knee & hip), low back pain, etc. etc. for years now. I’m starting to wonder if it’s been AVN all along… I thank you so much for reaching out to me & for sharing your story. I also thank the clinic doctor & radiologist who read my x-rays and caught the increased opacity and recognized it as a sign of potential AVN. Of course I hope you do not have AVN, but if you do I’m glad I came across your blog. It’s a rare disease, it’s hard to find doctors who know about it and as a community we have to help educate one another and share our findings. I wish you all the luck in the world when you meet with the orthopedic specialist. Someone with AVN had better keep their wits about them and hone up on research skills and not be in a state of this could never happen to me! Of course I didn’t do any of that. I thought i had arthritis in my one knee after taking high dose prednisone 3 weeks for inner ear problem together with 2 antibiotics cipro and leavaquin. A rheumatologist called me before Easter in 2011 after getting MRI results 4 days earlier and said you have an irreversible bone disease; how much alcohol do you drink? You better cut back. it is called avascular necrosis. Prednisione wouldn’t do this as you didn’t take it long enough. I was full of stress trying to get some information from him. He mentioned “core decompression” as a controversial procedure but your disease is irreversible so “deal with it.” That began a nightmare journey as he left for his vacation. I just recognized the word necrosis as meaning dead. i took leave of absence from work. I made the scene of seeing so called AVN experts from the Avascular Necrosis Foundation list of experts. The first doctor was just a local doctor I got to see and he was about 70 years old. He said you don’t have AVN; you have bone marrow edema and I’ll cut it out of that knee. He advised me not to take the other MRI recommended by a radiologist of the other knee. I did take it and found a terrible condition in the other knee of AVN. I then saw one doctor who said you are too old for core decompression being over 50. I read articles that implied core decompression at stage one has huge success rate (I thought it meant I’d be cured). I saw one doctor who said if you have it in knees, 90% chance it is in hips and gave me MRI’s for hips and shoulders to be taken. I saw lead orthopedist of state university who said clinically you have no signs of AVN in hips and only if those MRI’s show it is in hips would I consider core decompressions on you (age factor — over 50). I saw a person who said they were a top AVN expert and at stage one you have 50 percent chance of success with core decompression. i saw a doctor who said he’d never operate on me; too old; you won’t like artificial knees; core decompressions were big topic 11 years ago but he only did one time on knees. i despaired and went along with the one who offered me the 50 percent success rate. My knees were in so much pain. I had holes drilled in all bones comprising knees and my hips and one shoulder. I then learned new state of art for huge lesions and multi lesions was stem cells. I wrote all over the country and no one would give them to me. I begged for free fibula vascularized graft and was told you are too old. in 3 months post the surgery my knees were killing me (had to retire; remained non weight bearing) and I saw the surgeon who had done the cores. He said he would do more cores (36 more holes in the bones) and I had moved from stage one to stage 2. i asked how much new bone growth do core decompressions grow? He said only ten percent chance of that; they are for pain relief. I despaired but kept writing everywhere. In December, after a 3 month wait, to see a surgeon who does stem cells in hips (everywhere told me knees, leg bones cannot benefit from anything) the surgeon refused to do the cores because the holes had already been drilled the prior June 2011. I contacted Dr. Kelly in Denver Clinic for Extremeities at Risk; she phoned me when I was out; left message no need for further surgery at this time. I phoned and emailed when could I get stem cells? No response. i despaired. In March i started hyperbaric oxygen treatment (but I can only hear in one ear) and got baratrauma. I despaired. Now, I’m trying to get overseas to try once more time can anything save my hips and maybe later my shoulder? I’ve no confidence this will work out. I’m not positive anymore because I saw 13 doctors and all they talk about it seems is joint replacements. I’m now 63. The last doctor i saw was a long distance from me in April 2012 and he said stem cells don’t work and are not cost efficient; your joints collapse in total in 2 years time (doesn’t leave me much time as I got this 18 months ago). I pray somebody in another land is working on AVN as not much is being done for large lesions, multiple lesions, and older people no matter how many joints are involved. America is not advancing anything much in this field: only replicating what other nations did long ago and still just at a clinical trial level for the most part. God help many of us. If you do have small lesions and are young you may have a fighting chance. Do investigate clotting disorders. I on my own (doctors were not interested in this topic for my systemic AVN) contacted Dr. Charles Glueck and I do have 2 clotting disorders. He has been away for six weeks. I’d love to know if I should take clotting medications when he gets back and gets around to me. But i lost 18 months because NObody stressed that is important to be treated for clotting disorders. I saw 13 orthopedists and only 3 mentioned taking Fosamax so I lost a long time not taking it. I started April first of this year thinking well all these bones are going to collapse so i might as well try something. No, AVN is at lowest level on scale of things in medicine here in USA I believe. No funding. I am so happy to find this blog and learn I am not the only one with my medical issues. In 1984 or ’85 I was given massive doses (over 1,000 units/day) to treat my low platlette count known as ITP. In 1994 I woke up with extreme pain in my right knee. After having an MRI I was diagnosed with AVN. My doctor told me to walk with a cane & avoid stairs. Fast forward to 2012. My “good” left knee starting hurting after I had ankle pain. My doctor ordered an MRI and the results indicate I have AVN in my left knee. The MRI was only on my knee. I’m wondering if I might have it in my left ankle also. With two bad knees a cane doesn’t work. I now use my rollator to get around. I turn 58 on Nov 2nd. I am a veteran & I use the VAMC for my medical problems. My AVN issues are only a small part of my medical history. If it weren’t for the VAMC I would not be able to pay for my medical needs & prescriptions. I had the MRI on my left knee this week and got the results today. I am now waiting for an appointment with orthopedics. Karen, I also have ON in the ankle with collapse. I too had ITP until I had a splenectomy. I didn’t do the steroid treatments due to having Type 1 Diabetes so they gave me IVIG treatments to get the platelet count high enough to remove my spleen, I am 55 years young and was just diagnosed with ON less than a month ago. it took months and 8 doctors before I finally got a diagnosis. The waiting is what caused the navicular bone to collapse in my foot so now I have very few options other than to live with this debilitating disease. Thanks for sharing your story. I too have been treated for ITP, it will never really go away because I have antiplatelet antibodies, but have been off meds for 2 years now. I was just diagnosed with AVN of my right hip in December after having severe pain. For now am only non weight bearing and pain is mostly gone.